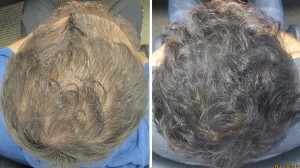 The consultant Gary came to see assessed him with Male Pattern Hair Loss between a Norwood type III vertex and type IV. With plenty of thinning, but still active hair Gary was an excellent candidate for a RealGROWTH™ program. The RealGROWTH® medications plan was recommended to Gary with a Money Back Guarantee if he wanted one. At Gary’s 4 month check-up the consultant was excited to see the results achieved with the pattern hair loss treatment he had recommended. Gary’s hair had grown back thicker all over and he is singing the praises of the RealGROWTH® program. The biggest complement is to hear Gary talk about referring his friends to Ashley and Martin.